Be the first to hear about their new releases and deals. Download the Booksprout app and search for Skylerr Darre today! Skylerr Darren (born Skylerr Darren Chang) is an American author, musical writer, and artist. Born in the city of Upland, California on August 18, 1998, Darren displayed a broad interest in drawing and writing short stories while still in elementary school, and at the age of eight years old he developed a comic strip about a rabbit with supernatural abilities which eventually lead to the publication of the short book in Skylerr's school library. Darren continued to pursue this creative passion which eventuated in him drifting off into the horror/thriller genre in which he calls "The darker side of life." In the summer of 2014 at the age of fifteen and while still in high school, Darren attended VVC (Victor Valley Community College) and began studying English 50 and Art History to which he did well in. During this time, Skylerr began forming the concept to his would-be published novel 'Interview with The Devil: Part 1 Victor's Account' only knowing that he simply just desired to write and bring to life the most disturbing subject matters he could think of. The morbid aspect of life had always been a fascination of Skylerr's after years of watching horror movies and listening to horrorcore and he wanted to create something of his own. 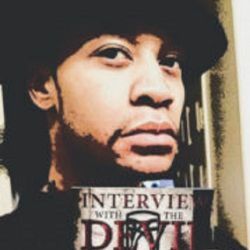 At the end of 2015, his first book 'Interview with The Devil: Part 1 Victor's Account' had been completed, not even a year after graduating from high school (Mojave River Academy) at the age of sixteen. Aside from focusing on writing, Darren also enjoys painting on his leisure, the majority of his artwork taking on the role of disturbing shock art as well as writing music that caters to the horrorcore genre. Skylerr has had book signings at several venues in the Las Vegas area, the most recent being at "Avery's Coffee Shop." On May 18, 2018, he released his Second novel "Interview with The Devil: Part 2: Lanza's Account," the continuation to the first novel "Interview with The Devil: Part 1: Victor's Account." Part 2 will tie in the loose ends that Part 1 left the readers with, and will also cover social and political issues and controversial events that have been occurring lately. 'Lanza Bhoadar-Lionel' is the main antagonist in the novel. The suggested age for the book is 17+ mainly for its graphic content and strong language.